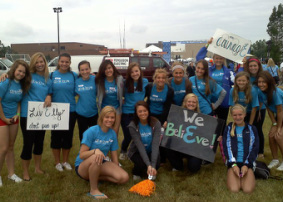 The Elly’s Angels Foundation was formed in 2009 as a volunteer organization. Inspired by Ellyce Kausner, who was killed when Continental Flight 3407 crashed into a home in Clarence, the Elly’s Angels Foundation supports the development of strong, confident young women through volunteer opportunities and mentorship. Partnering with Carly’s Club, Special Olympics, Roswell Park Cancer Institute, and many other local organizations, Elly’s Angels is proud to support the WNY community at events throughout the year. Elly’s Angels also provides financial support to special needs infants who are in need of adoption through Adoption S.T.A.R. Since its inception in 2009, Elly's Angels has been the recipient of two national community service awards, and has attended dozens of events in Western New York. The vision of Elly's Angels is to empower young women everywhere with the knowledge that the more you give, the more you get. We seek to bring the cheerleading community together with the united purpose of serving others.